Apple iPod Sport Tech-Life Machester United Won The Carling Cup Thanks To iPod! Machester United Won The Carling Cup Thanks To iPod! iPod was the instrumental key to Manchester United's latest sweet success in Carling Cup! Although it might sounds a little presumptuous, one can't help but agree what had happened during the final showdown between the red-hot Manchester United and Tottenham! All hail the iPod! Those who had watched the final showdown are witnesses of the advent of iPod into top-flight football! Now the naysayers can't argue that iPod is not playing a big part in our lives anymore. At least not in football! The Manchester United's dressing room will be buzzing about their latest weapon-iPod! We are the Champion!!! Manchester United rocks! Manchester United goalkeeper Ben Foster primed himself for the League Cup final penalty shoot-out by watching footage of Tottenham's penalty takers on an iPod. Ben Foster is indeed one geeky goalkeeper! From razor sharp reflexes to inhuman courage displayed, Ben Foster has been able to rely on some top-notch qualities during his rise to prominence with Manchester United, but even he must have doubted the ability to squint at a tiny iPod video screen would ever come in handy. Tonight his brief "geekiness" has rewarded him handsomely! What else can we use iPod for? We never know right? Finally, my time has come...thanks to iPod! Foster was the hero of his club's League Cup final triumph over Tottenham at Wembley last Sunday thanks to 2 unbelievable saves during the match and another even more important intervention in the penalty shoot-out! It was Foster's superb stop of Jamie O'Hara's spot kick in the penalty finale that handed United the momentum they required to lift the League Cup. And Foster had no qualms or whatsoever about revealing the secret of his success-an iPod! Gosh this is like a free advertisment for Apple's iPod. A lot of Manchester United's fans will grab these gems soon. YES!!! Just like what I saw on iPod! Eric Steele, United's goalkeeping coach, had made a compilation of video clips of Tottenham's players taking penalties in previous matches and put them onto an iPod so Foster could roughly catch a glimpse of where they were likely to strike their spot kicks! One very good thinking done by Steele huh! I'm sure the Fergie will shower him with something later on. Guess which colour did Foster pick? In the final moments before the shoot-out Foster could be seen intensely studying the iPod with Steele. It was time well spent indeed. I wonder if iPod is the very reason why Van Der Sar could keep a record-breaking clean sheets this season! So now that the cats are out of the bag, the other goalkeepers know what they should get for themselves right? So Peter Cech and Iker Casillas should really but an iPod if they were to stay on top of the game. P.S. : I'm sure Steve Jobs is very happy with what he heard huh! Yes!! MU is on to greater things - more silverware! Snail-Inc-->I thing he already is. Perhaps Steve Job is negotioating the terms and conditions with him right now. LOL ;D Thanks for dropping by. I think iPod is only useful in penalty kick lah. In normal play time, there are simply too many possibilities. BTW, van der Sar conceded one goal in the match against Newcastle. 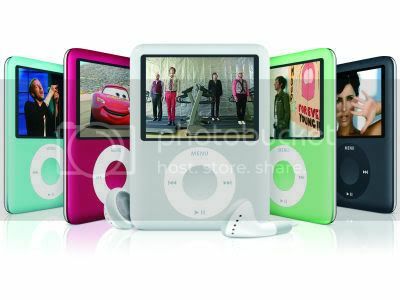 I can't imagine what my life would be without my iPod nano!!!! It's my life!!!! I would like to own one too but find them a tad expensive. Nah..I would rather buy a lens than spend on an ipod. Hi Tekkaus, did you just update your blog? I saw your blog being updated 4 hours ago on my blog, and came over here, but surprised there's no new post. How you do that? And why is the title appears as 'Links for 2009-03-07 [Digg]'?